In July, the House of Representatives passed the Interior Appropriations Bill reflecting President Obama’s request for $1,000,000 for the purchase of the Hurdygurdy Creek property. This action confirms the national significance of Hurdygurdy Creek and the Smith River as a salmon stronghold. If the Senate and House both agree to this funding, the Smith River Alliance (SRA) will purchase a portion of the property in 2010. 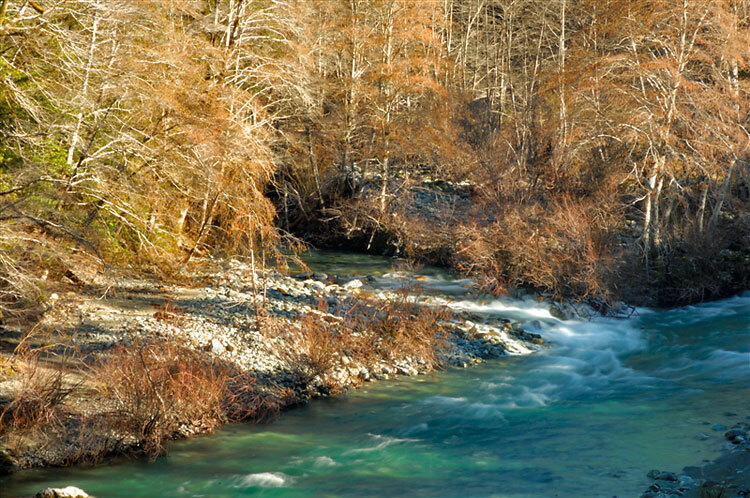 The value of protecting Hurdygurdy Creek goes well beyond the watershed boundary of the Smith River. Both Hurdygurdy Creek and the Smith are considered an important refuge for salmonid species and a key source of wild fish for restoration of other watersheds — such as the Klamath River to the south. The Smith River is the only designated “salmon stronghold” in California. This concept (see Salmon Stronghold Legislation below) of protecting and restoring salmon strongholds — our healthiest remaining Pacific salmon ecosystems is recognized as a critical part of our recovery efforts for wild salmon. The Smith River is also one of the “crown jewels” of the National Wild and Scenic River System and the last wild river in California with over 490 square miles of its watershed protected by the Smith River National Recreation Area (NRA), established in 1990. Since 2002, SRA has worked with our public and private partners to implement restoration projects on the 25,000-acre addition to Redwood National and State Parks, named for Mill Creek, a large tributary of the Smith River that meets the main stem of the Smith at Jedediah Smith Redwoods State Park. Over the last century, the Mill Creek property was the focus of intensive industrial timber management. Today the focus is an integrated program of habitat and watershed restoration and erosion control — with a goal of restoring watershed health and native fisheries to levels of historic over-abundance. Despite its industrial past, Mill Creek is one the State’s premier wild coho salmon streams. It provides habitat for many native species including five salmonid species, marbled murrelet, northern spotted owl, mountain lion, and Pacific fisher. The Mill Creek addition also protects the mid and upper watershed of Mill Creek — above the world-famous primeval redwood groves of Jedediah Smith Redwoods State Park. In fact, the property includes portions of four other watersheds including Rock Creek, Wilson Creek, West Fork Hunter Creek, and Terwer Creek. 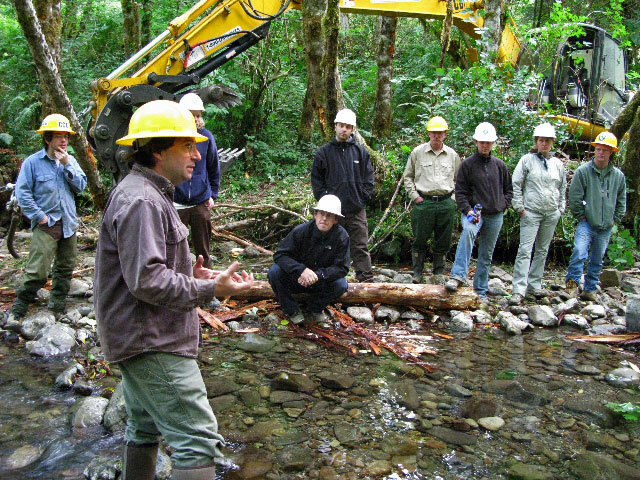 Over the span of several work seasons, Fiori and the project team — including the California Conservation Corps, have created over 20 habitat structures in and around the East Fork of Mill Creek to restore essential habitat for salmon and other aquatic species. The structures include large logs with root wads as well as smaller wood. Monitoring, field inspection, and observations from the Mill Creek Fisheries Monitoring Program has confirmed that these complex wood structures are definitely contributing positively to channel form and function — as well as providing important habitat for all life stages of salmonids and other aquatic species. 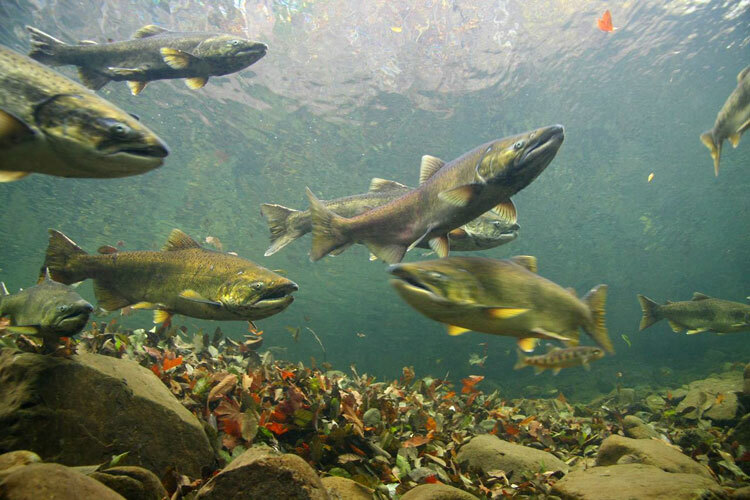 Bipartisan legislation would protect our healthiest wild salmon ecosystems. Congressman Mike Thompson (D-CA) and Mike Simpson (R-ID) have introduced legislation to protect and restore the healthiest remaining wild Pacific salmon ecosystems in North America — “Salmon Strongholds.” Senator Maria Cantwell (D-WA), with co-sponsorship from the entire West Coast Senate delegation, introduced a companion bill on April 2nd. The Pacific Salmon Stronghold Conservation Act will complement vital efforts to recover threatened and endangered salmon populations by directing new federal resources toward voluntary, incentive-based conservation efforts in salmon stronghold basins across Washington, Oregon, Idaho, California, and Alaska. The Pacific Salmon Stronghold Conservation Act (S. 817; H.R. 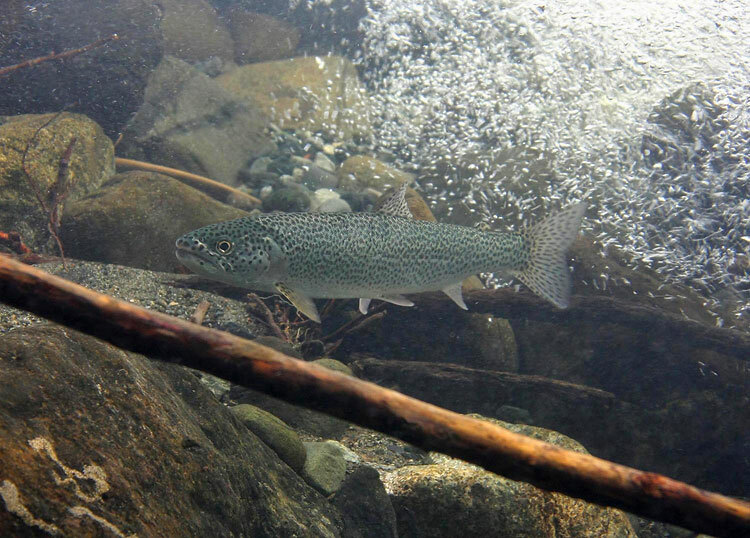 2055) will establish a new, proactive U.S. policy recognizing the need for conservation of salmon strongholds as a complement to recovery of federally-listed salmon populations. It will also create a grants program to support cooperative conservation efforts that implement locally-led, high value conservation actions in salmon strongholds across Washington, Oregon, Idaho, California, and Alaska. Senators Barbara Boxer and Dianne Feinstein are original co-sponsors of the legislation. The Smith River is officially recognized as a “Salmon Stronghold,” the first such designation in California. The 2009 Smith River Adult Fish Count drew fifty volunteers from across the state to Rock Creek Ranch for training and base-camp for the operation. On July 25th, the team successfully surveyed twenty-three contiguous miles of the South Fork Smith River, counting a total of 665 adult cutthroat trout, 58 resident rainbow trout, ten steelhead and five spring-run Chinook salmon. In addition, twelve miles of the Middle Fork Smith were surveyed in late summer by volunteers and Mike McCain of the USFS. This was the tenth year that SRA has hosted the Summer Adult Fish Count. Many local residents participated, and graduates of SRA’s Immersion Camp provided valuable leadership and instruction. Other highlights included a potluck BBQ at the Long House, and big-screen (outdoor) video presentations about salmon and habitat restoration hosted by Thomas Dunklin. A special thanks to the AmeriCorps Watershed Stewards who came early for the training, brought necessary grocery items, prepared meals and counted fish! “AmeriCorps members typically make great fish-counters. I am particular grateful to Melissa Scott who took the initiative of getting food donations, as well as coordinating several meals,” said Gary Reedy, Fish Count Organizer. It was an outstanding summer for Immersion Camp! In late July, SRA hosted the Bar-O Boy’s Ranch and partnered with the Oregon Museum of Science and Industry (OMSI) to engage youth in learning about the beauty, wonder, and biological productivity and diversity of the Smith River. Bar-O Boy’s Ranch, as residential treatment and rehabilitation program for at-risk boys run by Del Norte County, traveled to Rock Creek Ranch for Immersion Camp—and through camp they discovered a sense of connection and stewardship. 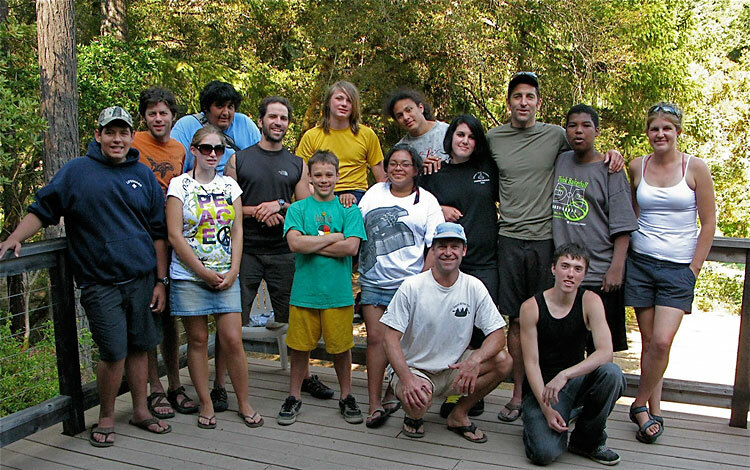 These “at-risk” teens were engaged and eager to experience the river and its many lessons from the moment they arrived. Highlights included: collecting aquatic invertebrates, exploring the riparian habitat, learning to snorkel in the river and identifying the fish they saw in the river. These fish were counted as part of a “mini” Fish Count. Smith River Alliance partnered with the Oregon Museum of Science & Industry to offer a visit to the Smith River as part of one of their ten day Salmon Tour program geared to youth between the age of 14 and 17. It was wonderful having OMSI with us for 3-days, said Sean Keller, Immersion Camp Director. “With OMSI, we delved deeper into the study of aquatic invertebrates and we collected and identified all nine orders of insects, a real testament to the health of the Smith River,” said Sean. As an icebreaker and wake-up call, Immersion camp begins with a morning challenge. On Day Two, campers were presented with the “Team Jump-Rope Challenge,” which demand that the group find a strategy for all participants to successfully execute jump the rope at the same time. Early efforts are awkward and hilarious until a strategy or plan is revealed. Of course, no plan is ever successful unless it can be clearly communicated to each team member. In jump rope, and in fish counting, and in everyday life — clear communication is a critical skill. After many attempts and blunders, all teams were successful. The mission of SRA’s Immersion camp is to build environmental leadership capacity in youth through personal challenges, team-building activities, and scientific investigation of the natural world. Rock Creek Ranch is in the midst of a busy season. 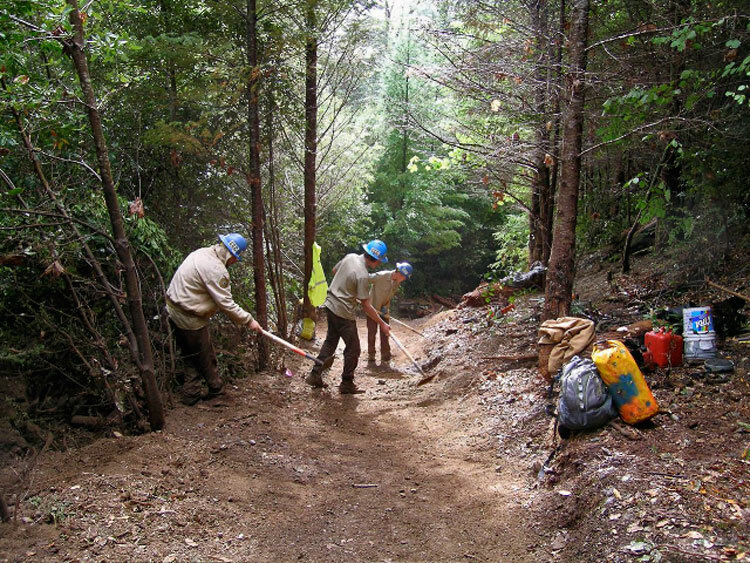 The California Conservation Corps (CCC) has trail crews staying at the Ranch this fall — and they will be there until November 4. Their project is the restoration and construction of the historic Kelsey Trail in the vicinity of Big Flat, Hurdygurdy Creek, and Canthook Creek along the South Fork Smith River canyon. The Kelsey Trail was an historic trail route first used by Native Americans as a key trade route to points east. Later, with the arrival of miners and settlers, the Kelsey Trail supported mule trains between the coast and Crescent City to Fort Jones and Etna. Once restored, the Kelsey Trail will serve as a link between the California Coast and the Pacific Crest Trail. Project partners include the Del Norte Resource Advisory Committee, Del Norte County, Redwood National and State Parks, the Rose Foundation, and the California River Parkways Program. We’ll keep you posted on the progress of this exciting project. We know there is always a great team behind every successful project and organization. With that in mind, we are especially grateful to the following businesses and corporations who have joined us in 2009 as River Guardians. Hampton Inn and Suites in Crescent City; Jeff Bright Steelhead Flyfisher & Jeff Bright Design; Organic Essence Body Care Products; Park Avenue Catering; and Thomas B. Dunklin Panoramic Photography and Videography. Organic Essence USDA certified organic body care products are inspired and created in a place surrounded by the beauty of the redwoods, the ocean and pristine rivers. This setting, clarity of purpose and purity of ingredients translate into healthy, organic body care for everyday use. Organic Essence is also a pioneer in developing and using biodegradable/home compostable packaging. Please try their wonderful products! Thank you for supporting our friends and partners!